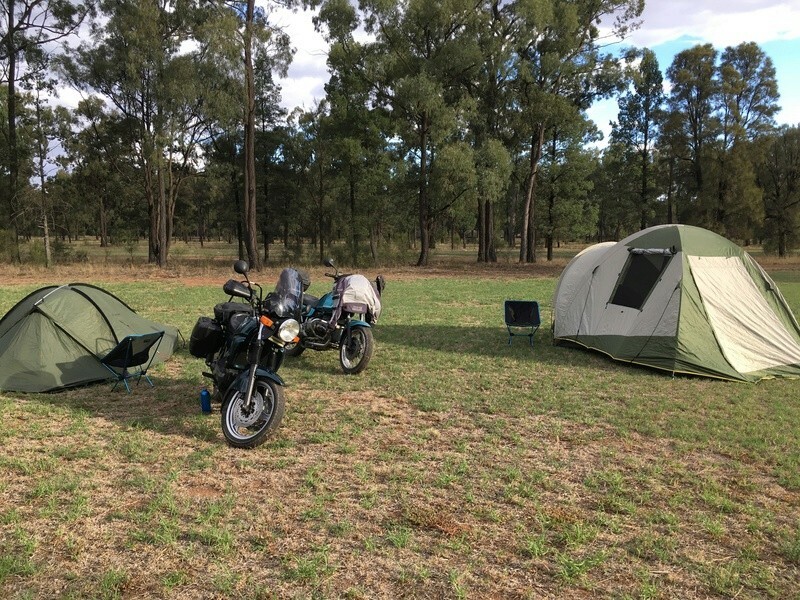 I have just decided to have an overnight ride to the Pigs n Pines Rally being held this coming weekend, 17th & 18th March at Spring Ridge, west of Quirindi in New South Wales. I have never been to this rally so have no idea what it will be like but the ride there and back will be good. If anyone wants to join me I will be leaving the Hunter Expressway Northbound Truck Rest Area at Branxton at 7:00am on Saturday morning, or alternatively meet up along the way or at Spring Ridge. Here is a map of the route I am taking. Here is a link to the rally information. Tom and I met at the usual truck rest area at Branxton at 7:00am on Saturday ready for the day's adventure but a little concerned at the sudden change in weather forecast to very hot. 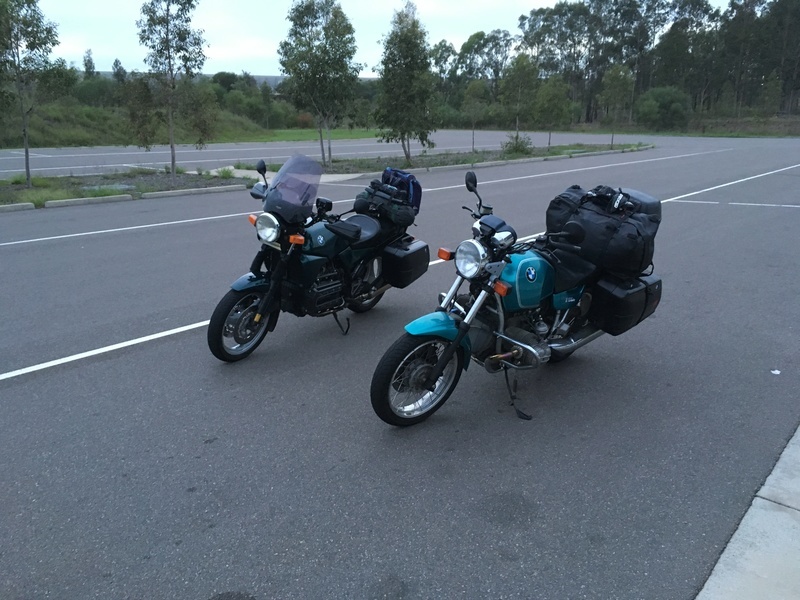 We headed up the Hunter Valley beyond our usual coffee stop at Merriwa to the small town of Coolah for our refreshments and remarked that the ride so far had been much cooler than we expected. The planned route then took us past "The Back Stump" (in Aussie lingo Beyond the Black Stump means you are in the middle of nowhere), north through a settlement named Tambar Springs, onto Mullaley and then to Gunnedah for lunch in the air conditioned Golden Arches as the forecast had proved correct and it was now 39 degC. Once fed we headed south east down past Curlewis and attempted to cut across to our destination at Spring Ridge via Goran Lake Road which quickly turned into a very deep sand pit, so we retraced our route for a few kilometres and took the next available route to our destination. 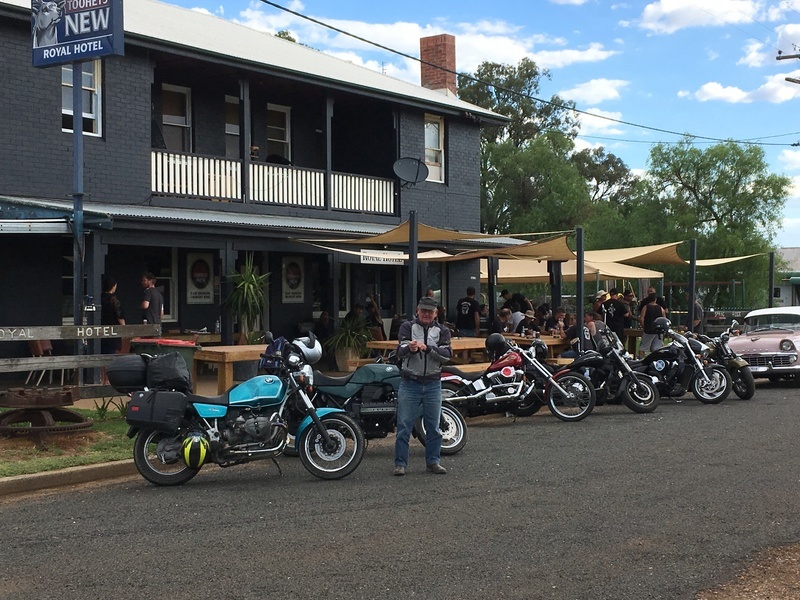 Parked at the pub for a couple of coldies had our BMWs looking decidedly out of place amongst the herd of American V Twin Iron. As we signed in at the camp site, conveniently a hundred metres from the pub, the lady at the gate excitedly told us that the band had just set up and the music would be pumping shorty - a horrified look between Tom and I and we rode as far away as we could get in the campsite in the hope that we would get some sleep before the early hours of Sunday morning. Here's one for Seanii but no canine on board. 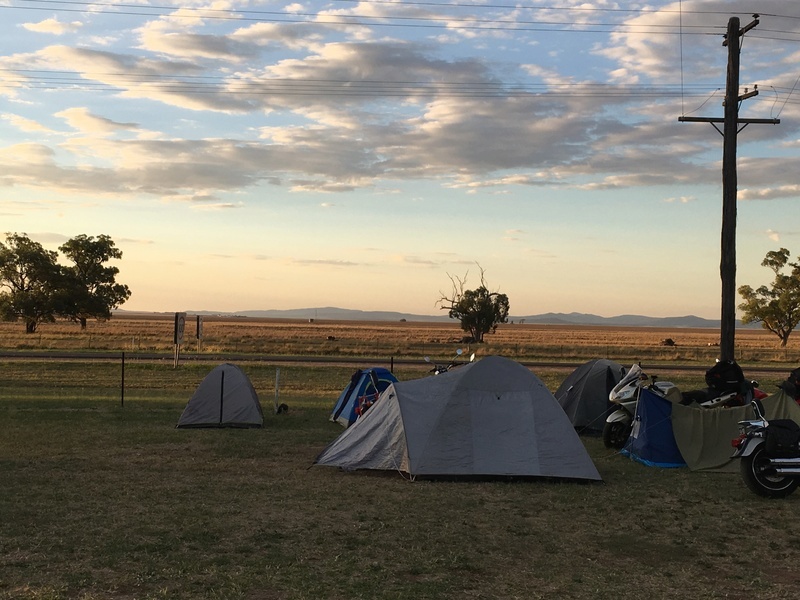 We got the tents set up on our own patch of ground which next morning turned out to be on the golf course - hey we didn't see any dividing fence! The typical countryside around Spring Ridge is black soil plains, very good agricultural land - wide open spaces. And the band played on but we wandered back to the pub for a couple of night caps and now the vehicle lineup had changed to farm utes and the clientele to guys and gals in boot scootin' attire. We did get some sleep after all. Sunday morning dawned hot and humid as predicted for our trip home over the high country via Port Stephens Cutting (it wasn't even cool at 1,200 metres up the mountain). Temps for the day ran around 38/39 degC so it was a tough day riding. Round trip was around 850 kilometres. Nice report and pics Gaz - thank you. As you swelter, we freeze! Snow on the ground again this morning after another day of snow, so bike stayed at home and I had to drive to work. No prizes for falling off and breaking things. As quick as it comes, it goes again, so should be back on 2 wheels tomorrow. Camping on the golf course! At least you didn't pitch your tents on that nice smooth green bit, with a little hole for a fire pit and a convenient flag to guide you back after a few too many coldies down at the pub! A short ride by your standards, but as you say, tough conditions with high heat and humidity. @Born Again Eccentric wrote: Camping on the golf course! At least you didn't pitch your tents on that nice smooth green bit, with a little hole for a fire pit and a convenient flag to guide you back after a few too many coldies down at the pub! This is very funny BAE. Maybe they used the flag pole as a tent pole. 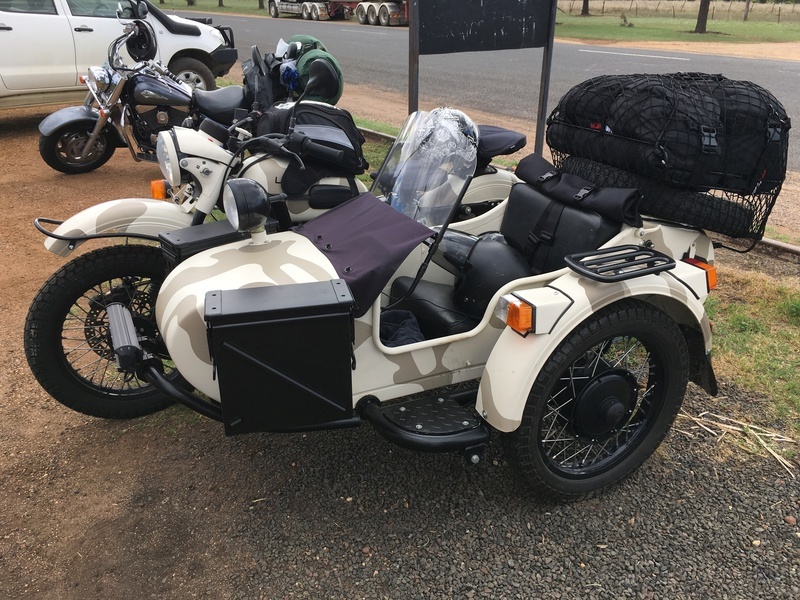 There is a part of me that secretly wants a Ural for all the dirt back roads around here. If only they didn't cost an arm and a leg for what they are! Tom's R bike is looking good. Later model one? I am sorry I couldn't get to that ride. You are correct Sean, Toms R bike looks even better up close. It has a show bike quality paint job with tastefull BMW ghost graphics. I don't have the words to do it justice. Sean, you could afford an arm, but no leg. @Stan wrote: Sean, you could afford an arm, but no leg. Not so sure about that, was at his place a while back and there were some spares just standing around. I ought to sue you blokes for being " ablist". Thank you for all the comments about the boxer which is a 1992 R100R. It still looks good despite coming down on a soft dirt road. It still looks good even after a suspected broken clutch plate on the way up Port Stephens cutting. The boxer rested overnight in a shearing shed. Gaz gave me a dink home on the 1100 and the boxer came home in a trailer yesterday. All in all, an interesting weekend. Thanks Gaz for your help in all this.